Palestinians flee Gaza as tensions escalate. A Texas teen who survived her family's massacre speaks out. And World Cup champ Germany parties like it's 1990. Thousands flee: Israeli forces dropped leaflets in northern Gaza to warn residents to move away from Hamas sites to avoid military strikes. More than 10,000 Palestinians have fled as the tensions escalate, the U.N. says. Removal operation: Years after it crashed off an Italian island, crews are preparing to set the Costa Concordia afloat again and move it to a port for dismantling. 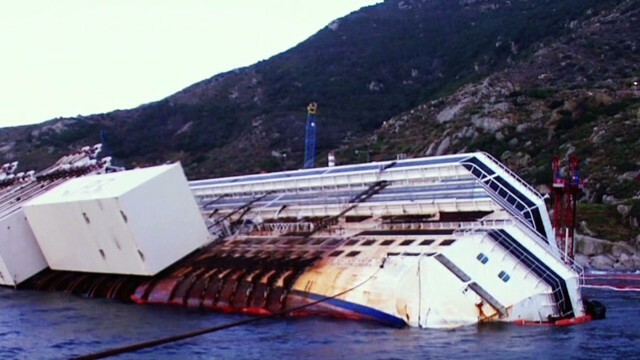 The ship ran aground off Italy's Giglio Island in January 2012, killing 32 people. And it's been 10 months since salvage teams rolled the vessel off the rocks. But there's still more work to be done. Hope amid horror: Cassidy Stay has seen the worst - the massacre of her parents and siblings, ages 4 to 13, in their Texas home. But the 15-year-old survivor is hopeful amid the horror. "Happiness can be found even in the darkest of times, if one only remembers to turn on the light," Cassidy said, citing J.K. Rowling's "Harry Potter and the Prisoner of Azkaban." The remarks at a memorial for her family were her first public comments since the killings. Germany wins a thriller: In a twist of fate, the host's vanquishers became the heroes. Germany's Mario Götze's late, late strike made the difference in the final against Argentina. His sublime goal prevented Brazil's neighbors and archrivals from lifting the trophy. Ultimately, all the nail-biter lacked was the goals that crowds in Brazil have come to expect. Released on bail: A suspect in a Florida movie theater shooting is free on bail. Curtis Reeves Jr. was held without bond after he fatally shot Navy veteran Chad Oulson in January following a confrontation over text messaging. An appeals court ruled last week that there's no justification for holding him without bail. Animal whisperer: How do you summon a herd of cows? Use bizarre noises, that's how. Lucky birdie: A man uses an industrial vacuum cleaner to rescue a duckling. Not camera shy: A clever octopus dismantles a scuba diver’s camera. Aww, baby: Tot gets a tongue bath from an eager dog ... and seems to like it. Meh all Mainstream News Outlets do that. My most heartfelt condolence to Cassidy Stay. Why is sensationalism such an avid ingredient in media reporting?